As a classical music-loving audiophile, I haven't found much to get me excited about downloads. Most of the downloadable catalog is available on CD, and many of those albums have been around for years. Even some of the fabulous-sounding downloads from 2L are also available on disc. Many of the world's great orchestras have recently started releasing recordings on their own labels, and many of these releases have been in the SACD format, sounding anywhere from very good to excellent. So although I don't have anything against downloading music, I just didn't have a compelling reason to do it. But that might be starting to change. The New York Philharmonic isn't the only orchestra to eschew physical media, but it has an ambitious download release schedule. 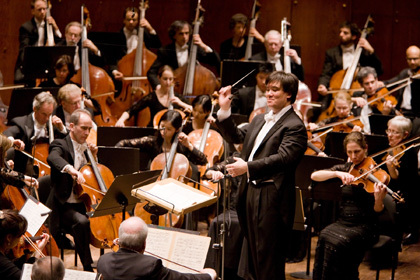 To commemorate music director Alan Gilbert's inaugural season with the orchestra, an entire season's worth of music (30 concerts) is being released on iTunes. You can see the complete list here. More importantly to audiophiles, HDtracks.com has made four of them available in high resolution. And by high resolution, I don't mean the CD standard of 16-bit/44.1kHz, but true 24/96. We can only hope that eventually they'll all be made available in this format, as lossy compression just doesn't cut it for classical music. The four recordings cover disparate time periods and styles, with works by Haydn, Schubert, Prokofiev, Rachmaninov, Mahler, Copeland, and Berg. There are symphonies, a concerto, and even a vocal piece. That's a lot of variety for just four concerts. And I'm confident that most listeners will find something worth trying. The musicianship on these recordings is nothing less than excellent, as you might expect from one of the world's premier orchestras. In particular, I found the recording of the Prokofiev with Yefim Bronfman to be both involving and flawlessly executed. One of the distinct advantages of a live recording is the level of energy from the musicians. Another is the total lack of editing. A live recording lets the music breathe and flow in the way that it's meant to be heard. If the purpose of your audio system is to mimic a live event, then a live recording seems like the best place to start. As for the sound quality of high-resolution downloads, the higher sample rate is evident in the increased harmonic texture of instruments and grain-free treble. But 24/96 doesn't necessarily mean that the recordings are perfect. I found the Prokofiev recording slightly bright, for example, as the piano lacked weight and the brass had a little too much sizzle. The concert Passion & Pain: Haydn, Adams, Schubert, and Berg had a more neutral tonal balance. All of the recordings also have a very front-of-the-hall perspective, which is a drawback for many live recordings, as the engineers are extremely limited in their choices for microphone placement. On the other hand, I have a number of live orchestral recordings that do a much better job of capturing the sound of the hall and creating a credible three-dimensional soundstage. On the whole, though, the recordings are still very good and are worth their modest price. If classical music downloads don't fully represent the present, they almost certainly represent the future. It's my hope that other orchestras will follow the New York Philharmonic's lead and offer their new releases not only as lossy compressed files but also in high resolution. We can influence the future in two ways: by writing to the orchestras with our wishes and by voting with our wallets and supporting high-resolution downloads when they're available. January 2009 - Introducing "The Digital Domain"
Note: Previous "The Digital Music Revolution" installments are available in the SoundStage! A/V archives, which is where the series originated.